Chris Gorak teams with Timur Bekmambetov on new PA flick! If you haven't seen Chris Gorak's indie debut, Right at Your Door, go do so immediately. 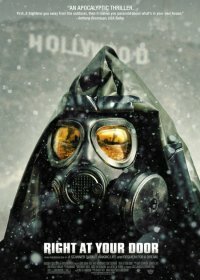 The film about about the aftermath of a terrorist attack in L.A. that unleashes a deadly toxic cloud, was one of my favorite new films a couple years back and it plays just as well today. That's why we're thrilled to hear that New Regency is partnering with Summit Entertainment on an all new post-apocalyptic actioner called The Darkest Hour with Gorak at the helm. Touted as a "28 Days-like thriller about a group of kids struggling to survive in Russia after an alien invasion," it sounds like War of the Worlds meets Tripods. Also, according to Deadline Hollywood, Wanted director, Timur Bekmambetov, is announced to be producing. The film will shoot in Russia at Bekmambetov's own personal facilities. More as it comes gang!